1. Skin 400g pack 6 Waitrose Gourmet Pork Sausages and place the meat in a bowl. wholegrain mustard. Squeeze the ingredients together using your hands. Shape into 8 patties. 3. Heat a large non-stick frying pan, then fry the patties for 4–5 minutes on each side, making sure the pork is cooked through with no pink meat. 4. 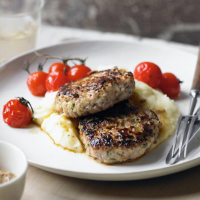 Serve with Waitrose Ready To Microwave Mashed Maris Piper Potatoes and some roasted cherry tomatoes on the vine.